Jillian Butler’s third time in a national touring production is especially charmed. Previously an understudy for Glinda and Nessarose in “Wicked” and part of the ensemble for “Rodgers & Hammerstein’s Cinderella,” the Boston Conservatory alum is now starring as Cosette in “Les Misérables,” which arrives Tuesday at Citizens Bank Opera House. The Globe chatted with the 25-year-old from Discovery Bay, Calif., about returning to Boston, meeting Claude-Michel Schönberg and Alain Boublil, and sloths. Q. How did you first get into performing? Q. You graduated from Boston Conservatory in 2015. How does it feel to be back in the city, starring in a Broadway show? A. It’s so surreal. It almost brings me to tears. To be honest, I’m just very proud to have graduated from there. It’s very full circle coming back. I found out I got this job when I was in Boston with “Wicked.” I had four days between ending my tour in “Wicked” in Philly and [starting “Les Mis”], so it was just so crazy. Q. How has your relationship with Cosette changed since you started playing her? A. I got to meet [“Les Misérables” creators] Claude-Michel [Schönberg] and Alain Boublil in tech for the show. I knew how epic “Les Mis” was, but I didn’t grow up singing it. It’s just so funny because I think that’s actually what helped me in the audition because I didn’t have this preconceived notion of Cosette, which I think is what then stressed me out a little bit when I was creating my version of her because I thought it had to be a certain way. Q. 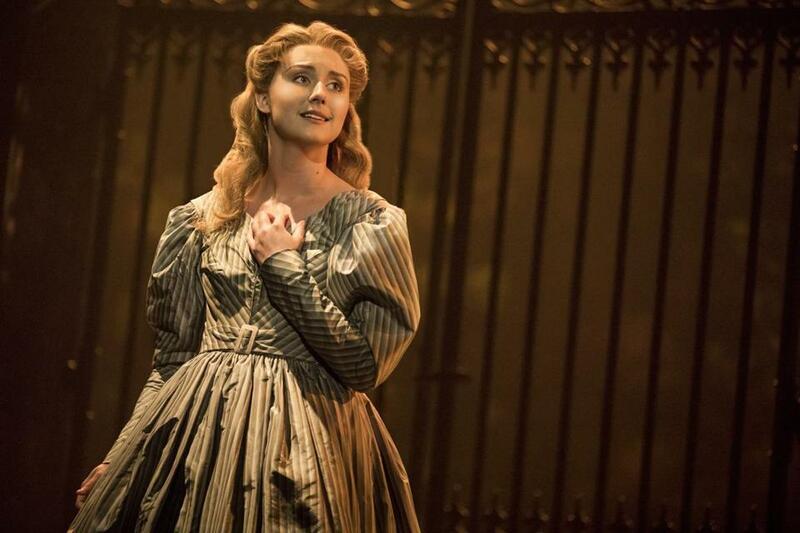 If you had to imagine Cosette as a modern woman, what would she be like? A. I think she would be a strong woman. She would fight for what she believes in, wouldn’t take no for an answer. But I also think everything she would do would be coming from a place of love, and I think the world right now needs more love in it. What I like about our show, too, is that even though the time period is different, the emotions and feelings that we’re feeling haven’t changed. It’s still young teenagers finding out what love is for the first time. Q. What are some of your favorite memories from touring? A. Our Valjean, Nick Cartell, he’s just the superhero of the show. We had this joke that if Cosette leaves Paris with him at the end of Act One, you would get her a puppy. And he literally did that through an organization and got this puppy to be able to come backstage that was going to be up for adoption in a couple days. I was so shocked. I love dogs. I love puppies. And then [there was] the sloth. I’d never really loved sloths as much as I realized I did [on tour]. I was on a layover on one of our travel days, and I saw this cute little sloth stuffed animal in the Chicago airport, and I was like, “I have to get it.” I have him in my dressing room, watching over Cosette’s clothes and Cosette’s bonnet. [Cartell] called the Denver aquarium, and they had a sloth. He literally called me at 1 p.m. and was like, “How would you like to meet a sloth in an hour?” I was crying because, you know, dramatic. Interview was edited and condensed. Jenni Todd can be reached at jenni.todd@globe.com.